Festivals and markets are as vital as ever in today's filmmaking scene. Learn what to do - and more importantly, what not to do - when it comes to festival submissions, festival attendance, and beyond for Documentary Films. Basil Tsiokos is a consultant for filmmakers and film festivals. He is a Documentary Programming Associate for the Sundance Film Festival, Shorts & Panel Programmer for DOC NYC, and a Documentary Programming Consultant for the Seattle International Film Festival. He is a regular contributor to Indiewire covering film festivals, and also serves as the publication's curator for Hulu's Documentaries page. As a visiting professor at Pratt, Basil teaches a course on film festivals and oversees students as they organize the Wallabout student short film festival. He co-produced the feature documentary THE CANAL STREET MADAM (World Premiere, SXSW Competition 2010). Between 1996-2008, Basil was the Artistic & Executive Director of NewFest: The NY LGBT Film Festival. Basil has served on numerous film festival juries and panels, including Atlanta, Atlantic, Berlinale, Cleveland, Dallas, Denver, DOC NYC, Fantasia, Full Frame, Hot Docs, IDA, IDFA, IFP, International Film Festival Summit, Lone Star, New York Film Festival, Outfest, Paley Center, Russia's Side-by-Side, Silverdocs, SXSW, Transylvania, and Tribeca. He can be found on Twitter as @1basil1 and on his blog what (not) to doc offering advice and information to filmmakers. Basil holds a Masters degree from New York University in Cinema Studies and two undergraduate degrees from Stanford University. Charlie Phillips is the Marketplace Director for Sheffield Doc/Fest, co-ordinating the MeetMarket, a unique opportunity for filmmakers and digital media producers to present their most innovative and passionate ideas to commissioners, buyers, funders and distributors. He also runs all other marketplace activities at Sheffield Doc/Fest, including public pitches, industry meetings, matchmaking and mentoring sessions, and year-round workshops. Before that, he was the Editor of FourDocs, Channel 4’s BAFTA-winning online documentary channel, and he continues to bring an interactive and cross-platform perspective to Sheffield’s marketplace activities. Eric Allen Hatch is the Director of Programming for Maryland Film Festival, which will hold its fifteenth annual festival May 8-12, 2013 in beautiful downtown Baltimore. Eric oversees MFF’s call for entries; recruits and manages the screening committee that evaluates entries; acts as liaison with distributors and filmmaker alum; represents MFF at other festivals such as TIFF and SXSW; and edits the annual MFF program guide. Eric also implements MFF’s year-round programming, including the popular Gunky’s Basement 35mm genre-film series, curated and hosted by musician Dan Deacon and video artist Jimmy Joe Roche. Eric wrote music, film, and literature reviews for Baltimore City Paper from 1997-2007. He founded, programmed and hosted the Baltimore Museum of Art's Free First Thursdays Film Series (2005-2008), focusing on visionary international cinema of the 1960s and 70s. Eric was a member of the screening committee for MicroCineFest, one of the country's premiere underground film and video festivals. He also co-founded the Red Room Collective, the organization behind the High Zero festival, an internationally lauded festival dedicated to experimental, improvised music. 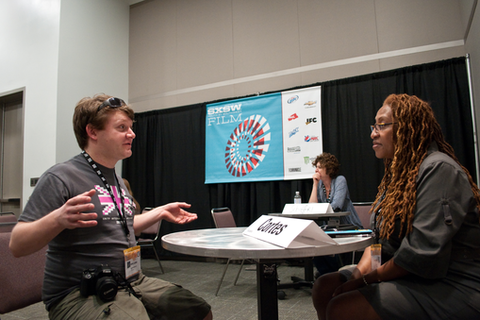 Hatch joined MFF’s programming team in 2007, and became director of programming in 2010. For over fifteen years, Erik has led non-profit community-based regional film festivals in the South and Pacific Northwest corners of the country -- all three of which were ranked as one of MovieMaker Magazine's "25 Film Festivals Worth the Entry Fee" during his tenure. In 1999, he co-founded the Sidewalk Moving Picture Festival in Birmingham, Alabama, serving as Director for its first eight years and growing the event into a filmmaker favorite and one of Time Magazine's "Film Festivals For the Rest of Us." In 2007 he moved to Bend, Oregon to run the BendFilm Festival, where he created a program that The Oregonian called "the best crop of fictional features yet to screen at BendFilm." Since 2008, Erik has served as Executive Director of Indie Memphis in Memphis, Tennessee, which runs year-round programing and special events, including the annual Indie Memphis Film Festival, presented by Duncan-Williams, Inc. The 2012 festival attracted a record-setting crowd of more than 11,000 attendees and was named a named a "Top 20 Event" by the Southeast Tourism Society. Erik has served on numerous film festival juries, including SXSW, Slamdance, Atlanta, Nashville and the Biografilm Festival in Bologna, Italy. Greg Rhem is Director of Documentary Programming for Home Box Office. For the past eighteen years, he's been involved in discovering new and distinctive documentary programming for HBO Documentary Films. Some of his finds have been: the Oscar®-winning Freeheld, Born Into Brothels, Thoth, and Breathing Lesson: The Life and Work of Mark O’Brien; and Oscar®-nominated Mondays at Racine, The Last Campaign of Governor Booth Gardner and Spellbound. Mr. Rhem holds a M.A. in Media Studies from the New School University, and a B.A. degree in English and Film Studies from the University of Rochester.